Jerusalem is the most famous city in the world. It's located in the Judean Hills of Israel, with the Hinnom and Kidron valleys as part of its borders. Its elevation is 2600 feet above sea level. Mentions of the city can be found in Egyptian texts dating back to the 19th century BC. Jerusalem is first mentioned in the Bible as Salem, or Shalem, in Genesis 14:18, which describes a meeting between Abraham and Melchizedek. Jerusalem became the seat of power for the land of Israel during the time of King David. David drove the Jebusites out of Jerusalem (2 Samuel 5:9) and named it the City of David. He reigned there as King of Israel for 33 years, after reigning his first 7 years in Hebron. After David, all of the kings of Judah reigned in Jerusalem. David's son, Solomon, built the Temple in Jerusalem, which was later destroyed, rebuilt, and destroyed again. In 701 BC the Assyrians besieged Jerusalem. But, through the prayers of King Hezekiah and the prophet Isaiah, an Angel of the Lord saved the city (2 Kings, chapter 19). In 586 BC the city was conquered and the Temple was destroyed by Nebuchadnezzar and the Babylonian army. After the Persians defeated Babylon, some of the Jews who had been taken as captives by the Babylonians were able to return to Jerusalem and to rebuild the Temple. Jerusalem again became the capital of the land of Israel during the Hasmonean period, until 63 BC when the Romans occupied the city. Herod, a Roman vassal, rebuilt the city and reconstructed the Temple. Jesus visited and preached in the city, and was crucified outside its gates. After the death of Jesus, the city became holy to the Christians. The Romans destroyed the city and the Temple in AD 70. Constantine the Great sent his mother Helena to Israel in AD 326, and she became associated with Constantine's building of the first great Christian churches. 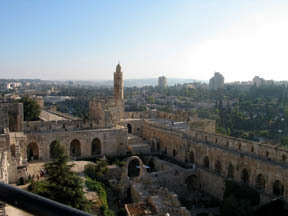 Many Archeologists since the 1800's excavated in and around Jerusalem. Today with 3 major religions centered in Jerusalem, it is the focal point of the world. But in the future the "New Jerusalem" will descend out of Heaven, and the world will live in eternal peace. The original site of Jerusalem, as it was during the days of King David about 3000 years ago, is still sometimes called the City of David. It is south of the Temple Mount and is surrounded by hills, as reflected in Psalms 125:2, of which the NIV translation reads: "As the mountains surround Jerusalem, so the LORD surrounds his people both now and forevermore." Jerusalem appears in 719 Bible verses: Josh 10:1, Josh 10:3, Josh 10:5, Josh 10:23, Josh 12:10, Josh 15:8, Josh 15:63, Josh 18:28, Judg 1:7, Judg 1:8, Judg 1:21, Judg 19:10, 1 Sam 17:54, 2 Sam 5:5, 2 Sam 5:6, 2 Sam 5:13, 2 Sam 5:14, 2 Sam 8:7, 2 Sam 9:13, 2 Sam 10:14, 2 Sam 11:1, 2 Sam 11:12, 2 Sam 12:31, 2 Sam 14:23, 2 Sam 14:28, 2 Sam 15:8, 2 Sam 15:11, 2 Sam 15:14, 2 Sam 15:29, 2 Sam 15:37, 2 Sam 16:3, 2 Sam 16:15, 2 Sam 17:20, 2 Sam 19:19, 2 Sam 19:25, 2 Sam 19:33, 2 Sam 19:34, 2 Sam 20:2, 2 Sam 20:3, 2 Sam 20:7, 2 Sam 20:22, 2 Sam 24:8, 2 Sam 24:16, 1 Kgs 2:11, 1 Kgs 2:36, 1 Kgs 2:38, 1 Kgs 2:41, 1 Kgs 3:1, 1 Kgs 3:15, 1 Kgs 8:1, 1 Kgs 9:15, 1 Kgs 9:19, 1 Kgs 10:2, 1 Kgs 10:26, 1 Kgs 10:27, 1 Kgs 11:7, 1 Kgs 11:13, 1 Kgs 11:29, 1 Kgs 11:32, 1 Kgs 11:36, 1 Kgs 11:42, 1 Kgs 12:18, 1 Kgs 12:21, 1 Kgs 12:27, 1 Kgs 12:28, 1 Kgs 14:21, 1 Kgs 14:25, 1 Kgs 15:2, 1 Kgs 15:4, 1 Kgs 15:10, 1 Kgs 22:42, 2 Kgs 8:17, 2 Kgs 8:26, 2 Kgs 9:28, 2 Kgs 12:1, 2 Kgs 12:17, 2 Kgs 12:18, 2 Kgs 14:2, 2 Kgs 14:13, 2 Kgs 14:19, 2 Kgs 14:20, 2 Kgs 15:2, 2 Kgs 15:33, 2 Kgs 16:2, 2 Kgs 16:5, 2 Kgs 18:2, 2 Kgs 18:17, 2 Kgs 18:22, 2 Kgs 18:35, 2 Kgs 19:10, 2 Kgs 19:21, 2 Kgs 19:31, 2 Kgs 21:1, 2 Kgs 21:4, 2 Kgs 21:7, 2 Kgs 21:12, 2 Kgs 21:13, 2 Kgs 21:16, 2 Kgs 21:19, 2 Kgs 22:1, 2 Kgs 22:14, 2 Kgs 23:1, 2 Kgs 23:2, 2 Kgs 23:4, 2 Kgs 23:5, 2 Kgs 23:6, 2 Kgs 23:9, 2 Kgs 23:13, 2 Kgs 23:20, 2 Kgs 23:23, 2 Kgs 23:24, 2 Kgs 23:27, 2 Kgs 23:30, 2 Kgs 23:31, 2 Kgs 23:33, 2 Kgs 23:36, 2 Kgs 24:4, 2 Kgs 24:8, 2 Kgs 24:10, 2 Kgs 24:14, 2 Kgs 24:15, 2 Kgs 24:18, 2 Kgs 24:20, 2 Kgs 25:1, 2 Kgs 25:8, 2 Kgs 25:9, 2 Kgs 25:10, 1 Chr 3:4, 1 Chr 3:5, 1 Chr 6:10, 1 Chr 6:15, 1 Chr 6:32, 1 Chr 8:28, 1 Chr 8:32, 1 Chr 9:3, 1 Chr 9:34, 1 Chr 9:38, 1 Chr 11:4, 1 Chr 14:3, 1 Chr 14:4, 1 Chr 15:3, 1 Chr 18:7, 1 Chr 19:15, 1 Chr 20:1, 1 Chr 20:3, 1 Chr 21:4, 1 Chr 21:15, 1 Chr 21:16, 1 Chr 23:25, 1 Chr 28:1, 1 Chr 29:27, 2 Chr 1:4, 2 Chr 1:13, 2 Chr 1:14, 2 Chr 1:15, 2 Chr 2:7, 2 Chr 2:16, 2 Chr 3:1, 2 Chr 5:2, 2 Chr 6:6, 2 Chr 8:6, 2 Chr 9:1, 2 Chr 9:25, 2 Chr 9:27, 2 Chr 9:30, 2 Chr 10:18, 2 Chr 11:1, 2 Chr 11:5, 2 Chr 11:14, 2 Chr 11:16, 2 Chr 12:2, 2 Chr 12:4, 2 Chr 12:5, 2 Chr 12:7, 2 Chr 12:9, 2 Chr 12:13, 2 Chr 13:2, 2 Chr 14:15, 2 Chr 15:10, 2 Chr 17:13, 2 Chr 19:1, 2 Chr 19:4, 2 Chr 19:8, 2 Chr 20:5, 2 Chr 20:15, 2 Chr 20:17, 2 Chr 20:18, 2 Chr 20:20, 2 Chr 30:14, 2 Chr 32:19, 2 Chr 32:22, 2 Chr 32:23, 2 Chr 32:25, 2 Chr 32:26, 2 Chr 32:33, 2 Chr 33:1, 2 Chr 33:4, 2 Chr 33:7, 2 Chr 33:9, 2 Chr 33:13, 2 Chr 33:15, 2 Chr 33:21, 2 Chr 34:1, 2 Chr 34:3, 2 Chr 34:5, 2 Chr 34:7, 2 Chr 34:9, 2 Chr 34:22, 2 Chr 34:29, 2 Chr 34:30, 2 Chr 34:32, 2 Chr 35:1, 2 Chr 35:18, 2 Chr 35:24, 2 Chr 36:1, 2 Chr 36:2, 2 Chr 36:3, 2 Chr 36:4, 2 Chr 36:5, 2 Chr 36:9, 2 Chr 36:10, 2 Chr 36:11, 2 Chr 36:14, 2 Chr 36:19, 2 Chr 36:23, Ezra 1:2, Ezra 1:3, Ezra 1:4, Ezra 1:5, Ezra 1:7, Ezra 1:11, Ezra 2:1, Ezra 2:68, Ezra 3:1, Ezra 3:8, Ezra 4:6, Ezra 4:8, Ezra 4:12, Ezra 4:20, Ezra 4:23, Ezra 4:24, Ezra 5:1, Ezra 5:2, Ezra 5:14, Ezra 5:15, Ezra 5:16, Ezra 5:17, Ezra 6:3, Ezra 6:5, Ezra 6:9, Ezra 6:12, Ezra 6:18, Ezra 7:7, Ezra 7:8, Ezra 7:9, Ezra 7:13, Ezra 7:14, Ezra 7:15, Ezra 7:16, Ezra 7:17, Ezra 7:19, Ezra 7:27, Ezra 8:29, Ezra 8:30, Ezra 8:31, Ezra 8:32, Ezra 9:9, Ezra 10:7, Ezra 10:9, Neh 1:2, Neh 1:3, Neh 2:11, Neh 2:12, Neh 2:13, Neh 2:17, Neh 2:20, Neh 3:8, Neh 3:9, Neh 3:12, Neh 4:7, Neh 4:8, Neh 4:22, Neh 6:7, Neh 7:2, Neh 7:3, Neh 7:6, Neh 8:15, Neh 11:1, Neh 11:2, Neh 11:3, Neh 11:4, Neh 11:6, Neh 11:22, Neh 12:27, Neh 12:28, Neh 12:29, Neh 12:43, Neh 13:6, Neh 13:7, Neh 13:15, Neh 13:16, Neh 13:19, Neh 13:20, Est 2:6, Ps 51:18, Ps 68:29, Ps 79:1, Ps 79:3, Ps 102:21, Ps 116:19, Ps 122:2, Ps 122:3, Ps 122:6, Ps 125:2, Ps 128:5, Ps 135:21, Ps 137:5, Ps 137:6, Ps 137:7, Ps 147:2, Ps 147:12, Eccl 1:1, Eccl 1:12, Eccl 1:16, Eccl 2:7, Eccl 2:9, Sng 1:5, Sng 2:7, Sng 3:5, Sng 3:10, Sng 5:8, Sng 5:16, Sng 6:4, Sng 8:4, Isa 1:1, Isa 2:1, Isa 2:3, Isa 3:1, Isa 3:8, Isa 4:3, Isa 4:4, Isa 5:3, Isa 5:14, Isa 7:1, Isa 8:14, Isa 10:10, Isa 10:11, Isa 10:12, Isa 10:32, Isa 22:10, Isa 22:21, Isa 24:23, Isa 27:13, Isa 28:14, Isa 30:19, Isa 31:5, Isa 31:9, Isa 33:20, Isa 36:2, Isa 36:7, Isa 36:20, Isa 37:10, Isa 37:22, Isa 37:32, Isa 40:2, Isa 40:9, Isa 41:27, Isa 44:26, Isa 44:28, Isa 51:17, Isa 52:1, Isa 52:2, Isa 52:9, Isa 62:6, Isa 62:7, Isa 64:10, Isa 65:18, Isa 65:19, Isa 66:10, Isa 66:13, Isa 66:20, Jer 1:3, Jer 1:15, Jer 2:2, Jer 3:17, Jer 4:3, Jer 4:4, Jer 4:5, Jer 4:10, Jer 4:11, Jer 4:14, Jer 4:16, Jer 5:1, Jer 6:1, Jer 6:6, Jer 6:8, Jer 7:17, Jer 7:34, Jer 8:1, Jer 9:11, Jer 11:2, Jer 11:6, Jer 11:9, Jer 11:12, Jer 11:13, Jer 13:9, Jer 13:13, Jer 13:27, Jer 14:2, Jer 14:16, Jer 15:4, Jer 15:5, Jer 17:19, Jer 17:20, Jer 17:21, Jer 17:25, Jer 17:26, Jer 17:27, Jer 18:11, Jer 19:3, Jer 19:7, Jer 19:13, Jer 22:19, Jer 23:14, Jer 23:15, Jer 24:1, Jer 24:8, Jer 25:2, Jer 25:18, Jer 26:18, Jer 27:3, Jer 27:18, Jer 27:20, Jer 27:21, Jer 29:1, Jer 29:2, Jer 29:4, Jer 29:20, Jer 29:25, Jer 32:2, Jer 32:32, Jer 32:44, Jer 33:10, Jer 33:13, Jer 33:16, Jer 34:1, Jer 34:6, Jer 34:7, Jer 34:8, Jer 34:19, Jer 35:11, Jer 35:13, Jer 35:17, Jer 36:9, Jer 36:31, Jer 37:5, Jer 37:11, Jer 37:12, Jer 38:28, Jer 39:1, Jer 39:8, Jer 40:1, Jer 42:18, Jer 44:2, Jer 44:6, Jer 44:9, Jer 44:13, Jer 44:17, Jer 44:21, Jer 51:35, Jer 51:50, Jer 52:1, Jer 52:3, Jer 52:4, Jer 52:12, Jer 52:13, Jer 52:14, Jer 52:29, Lam 1:7, Lam 1:8, Lam 1:17, Lam 2:10, Lam 2:13, Lam 2:15, Lam 4:12, Ezek 4:1, Ezek 4:7, Ezek 4:16, Ezek 5:5, Ezek 8:3, Ezek 9:4, Ezek 9:8, Ezek 11:15, Ezek 12:10, Ezek 12:19, Ezek 13:16, Ezek 14:21, Ezek 14:22, Ezek 15:6, Ezek 16:2, Ezek 16:3, Ezek 17:12, Ezek 21:2, Ezek 21:20, Ezek 21:22, Ezek 22:19, Ezek 23:4, Ezek 24:2, Ezek 26:2, Ezek 33:21, Ezek 36:38, Dan 1:1, Dan 5:2, Dan 5:3, Dan 6:10, Dan 9:2, Dan 9:7, Dan 9:12, Dan 9:16, Dan 9:25, Joel 2:32, Joel 3:1, Joel 3:6, Joel 3:16, Joel 3:17, Joel 3:20, Amos 1:2, Amos 2:5, Obad 1:11, Obad 1:20, Mic 1:1, Mic 1:5, Mic 1:9, Mic 1:12, Mic 3:10, Mic 3:12, Mic 4:2, Mic 4:8, Zeph 1:4, Zeph 1:12, Zeph 3:14, Zeph 3:16, Zech 1:12, Zech 1:14, Zech 1:16, Zech 1:17, Zech 1:19, Zech 2:2, Zech 2:4, Zech 2:12, Zech 3:2, Zech 7:7, Zech 8:3, Zech 8:4, Zech 8:8, Zech 8:15, Zech 8:22, Zech 9:9, Zech 9:10, Zech 12:2, Zech 12:3, Zech 12:5, Zech 12:6, Zech 12:7, Zech 12:8, Zech 12:9, Zech 12:10, Zech 12:11, Zech 13:1, Zech 14:2, Zech 14:4, Zech 14:8, Zech 14:10, Zech 14:11, Zech 14:12, Zech 14:14, Zech 14:16, Zech 14:17, Zech 14:21, Mal 2:11, Mal 3:4, Matt 2:1, Matt 2:3, Matt 3:5, Matt 4:25, Matt 5:35, Matt 15:1, Matt 16:21, Matt 20:17, Matt 20:18, Matt 21:1, Matt 21:10, Matt 23:37, Mark 1:5, Mark 3:8, Mark 3:22, Mark 7:1, Mark 10:32, Mark 10:33, Mark 11:1, Mark 11:11, Mark 11:15, Mark 11:27, Mark 15:41, Luke 2:22, Luke 2:25, Luke 2:38, Luke 2:41, Luke 2:43, Luke 2:45, Luke 4:9, Luke 5:17, Luke 6:17, Luke 9:31, Luke 9:51, Luke 9:53, Luke 10:30, Luke 13:4, Luke 13:22, Luke 13:33, Luke 13:34, Luke 17:11, Luke 18:31, Luke 19:11, Luke 19:28, Luke 21:20, Luke 21:24, Luke 23:7, Luke 23:28, Luke 24:13, Luke 24:18, Luke 24:33, Luke 24:47, Luke 24:52, John 1:19, John 2:13, John 2:23, John 4:20, John 4:21, John 4:45, John 5:1, John 5:2, John 7:25, John 10:22, John 11:18, John 11:55, John 12:12, Acts 1:4, Acts 1:8, Acts 1:12, Acts 1:19, Acts 2:5, Acts 2:14, Acts 4:5, Acts 4:16, Acts 5:16, Acts 5:28, Acts 6:7, Acts 8:1, Acts 8:14, Acts 8:25, Acts 8:26, Acts 8:27, Acts 9:2, Acts 9:13, Acts 9:21, Acts 9:26, Acts 9:28, Acts 10:39, Acts 11:2, Acts 11:22, Acts 11:27, Acts 12:25, Acts 13:13, Acts 13:27, Acts 13:31, Acts 15:2, Acts 15:4, Acts 16:4, Acts 19:21, Acts 20:16, Acts 20:22, Acts 21:4, Acts 21:11, Acts 21:12, Acts 21:13, Acts 21:15, Acts 21:17, Acts 21:31, Acts 22:5, Acts 22:17, Acts 22:18, Acts 23:11, Acts 24:11, Acts 25:1, Acts 25:3, Acts 25:7, Acts 25:9, Acts 25:15, Acts 25:20, Acts 25:24, Acts 26:4, Acts 26:10, Acts 26:20, Acts 28:17, Rom 15:19, Rom 15:25, Rom 15:26, Rom 15:31, 1 Cor 16:3, Gal 1:17, Gal 1:18, Gal 2:1, Gal 4:25, Gal 4:26, Heb 12:22, Rev 3:12, Rev 21:2 and Rev 21:10.